Micro-cut shredder features optimized cutting device technology that destroys 11 to 13 sheets of paper, creating 2,116 micro-cut/confetti-cut particles per page. It also shreds staples, paper clips and credit/store cards. High-quality materials provide safety and durability. Anti-Jam technology easily and quickly reverses paper if the machine is overloaded. Continuous-duty operation ensures continual shredding with no downtime. Energy Management Control System EcoSmart delivers particularly low power consumption of 0.1 watt in standby mode. Quiet operation feature shreds documents with a pleasantly quiet operating sound. Cutting rollers are made of hardened solid steel. 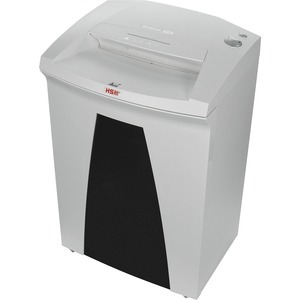 With Comprehensive Safety System, shredder is UL Approved and CE-Certified. It also features inspection window to monitor filling level; multifunction element for intuitive operation; and light barrier for automatic start/stop.